Demonstrators plan to mark the 17th anniversary of America’s longest war on Sunday. This Sunday marks 17 years since the U.S. invaded Afghanistan, a move that triggered years of combat, massive troop deployments and thousands of deaths. Some have called it the “Forgotten War” but not everyone in the United States is letting it escape their memory. The Indypendent talked with Ruth Benn of the New York City chapter of the War Resisters League (WRL) this week, ahead of a vigil organized by WRL and other peace groups slated to take place this Sunday. Demonstrators will gather in front of the New York Public Library on 42nd Street before proceeding to Times Square. Benn is also a proponent of withholding taxes as a form of anti-war protest and has co-edited WRL’s publication of War Tax Resistance: A Guide to Withholding Your Support from the Military. The Indypendent: Could you tell us a little bit more about the demonstration that’s happening on Sunday? Ruth Benn: We’ve done it for some years. And of course, additional wars over the years have brought in other issues or extended the scope of what we’re talking about to Iraq, of course, Pakistan, Libya, Yemen, Syria, Northern Africa. Our focus now is endless war and ending war, cutting the military budget, giving that money to humanitarian needs and saving the Earth. We’ve done different things over the years but the last few we’ve been walking to 42nd Street at Times Square. We usually have a fake coffin. Sometimes, somebody brings one of the drone models. What kind of response do you get? New Yorkers and lots of tourist people are rushing by but generally people who stop and talk are always like, “What is this about?” I’d say there are usually one or two people who come up, especially at Times Square, who have some argument about what we’re doing. Right after 9/11, it was quite different. When we were out in October 2001 saying no to the war, that was a much more tense period. But if people really think about war these days, I think a lot of people are just like, “What are we doing over there?” It’s been going on so long and we’re not making anything safer. It seems like most people don’t think about the Afghan War very much anymore. There’s a lot going on, but I think generally people just feel like it’s too complicated — unless it touches their lives. If you have somebody in the military who’s over there risking their life or has been killed, then you’re thinking about it. One of the points we try to make is that every taxpayer in this country should be thinking about these wars because of all the trillions of dollars that the United States is wasting on killing people, on devastating the environment and on all these things with our money. I can’t say why people seem to not want to think about this issue but it does seem to fade into the background. If it was on TV every night, if people saw the drones hitting a school bus full of children, maybe that would wake them up. But, it’s also not much in the media so people just take it off their radar. It’s interesting that in order to bring the war back into the forefront of public consciousness people bring up things like taxes rather than the immorality of the violence. Is that disheartening for you? People do seem to be getting pretty hard-hearted. If something happens to their neighbor, they run out and help and pat each other on the back. But, when it comes to a child being killed far away, it’s just not registering. There’s certainly a level of racism against Arabs or other people in other countries out there. The American people aren’t thinking worldly, not thinking about how small the world is now. Some could say that the pulse of the anti-war movement has been in decline in recent years, understandable given that the fighting has gone on for so long. 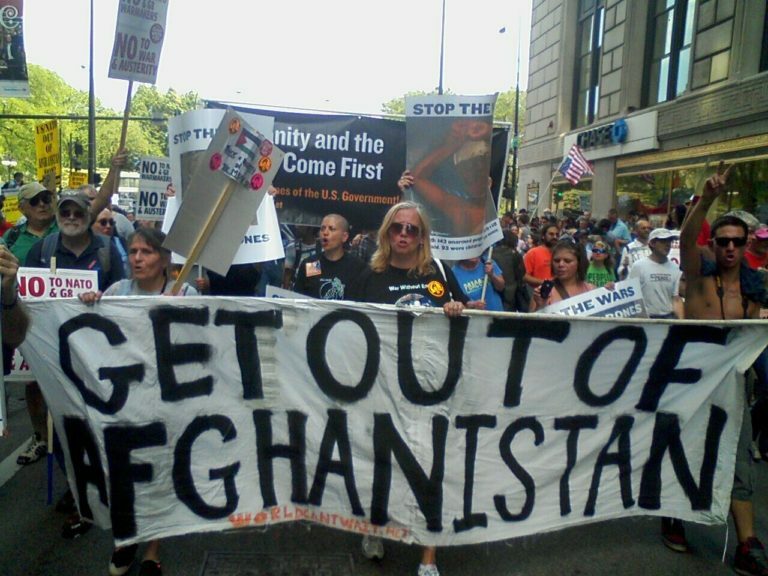 How can the anti-war movement stay relevant? It is true that the anti-war movement is smaller. Some other movements are stronger and I think the interconnections between the issues are always important to War Resisters League. Certainly in the last five, ten years, with the militarization of the police, it has become obvious that military weapons have come home. A lot of what we do in the anti-war movement is to try to keep making these connections, talking about how the military devastates the environment and relating it to climate change. And the money we spend on war could be spent on reparations for the people in countries that we’re destroying and also spent here at home. The money given to the military could go to schools or roads and bridges, public transportation, all these things. What is stopping us from ending the Afghan War? Well, the military-industrial complex. There are companies and individuals who are just making a ton of money out of weapons sales and that’s a huge factor. It interrelates with people not speaking out against it. How much longer do you see the U.S. government participating in this war? It certainly doesn’t seem to be any end in sight. 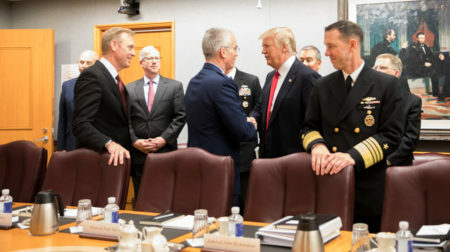 The government and the military talk a lot about bringing troops home from one place or another and transferring some of their war-making to drones and fancier weapons so that there are fewer troops out there. The more the fighting and killing are taken over by drones, the longer things will go on. The United States is building a huge drone base in Niger and who knows what else? You don’t always know what it’s doing. And the threats against Iran now are worrisome. That could be a whole other front for war. I’m not terribly hopeful about the violence ending soon. But, you know, I guess we’ll just keep going. We’ll keep at it. People from other countries around the world are pretty supportive about what we’re doing and thank us for being out there protesting and always feel so happy to see that there are Americans who are against the wars. There’s a strong anti-war sentiment around the world but I’m not sure what it will take for it to make the change that we want to see. I suppose it’s having people who are refugees from Iraq or Afghanistan who come by when we are protesting or sometimes join our vigils who are so grateful that someone is speaking against this. Also working with former military people who have been there and are telling their stories about what they saw on the ground, about what is being done, telling people here that it’s not the glorious war that they think it is. I know people will look at us on Sunday and say, “What’s the point?” But keeping the war in the face of people is really important. It’s one of many actions that we need to keep taking to make change in this country. Photo: Demonstrators march against NATO, May 20, 2012. Credit: Debra Sweet.